Cork Cage Corks of the World (P/N 91-041). These days everyone seems to be keeping the corks f..
Cork Cage Cowboy Boot (P/N 91-073). What should you do with all those corks you've managed..
Cork Cage Eiffel Tower (P/N 91-065). Artisan crafted from metal with all the details of the ac..
Cork Cage Handbag (P/N 91-038). What should you do with all those corks you've managed to ..
Cork Cage House of Corks (P/N 91-042). hese days everyone seems to be keeping the corks from a..
Cork Cage Robot (P/N 91-083). This fanciful robot is ready to serve your command! Open hing..
Cork Cage Wine Glass (P/N 91-044). What should you do with all those corks you've managed ..
Football Helmet Beer Bottle Cap Cage (P/N PSA-651FH). This fun conversation piece was designed..
Rooster Cork Holder (P/N 2316). These days everyone seems to be keeping the corks from a speci..
Wine Barrel Cork Cage (P/N 91-037). 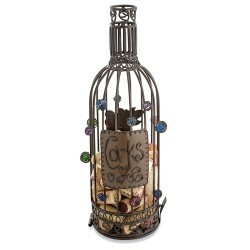 The wine barrel Cork Cage is a creative solution for your ..
Wine Bottle Cork Cage (P/N 91-035). Keeping the corks from a special bottle of wine, party or ..